You have added Northern Lights Aqua and Beige Glitter Maxi Dress into shopping cart. This pretty blue mint dress with taupe lining reminds us of an ice princess! The Northern Lights Aqua and Beige Glitter Maxi Dress is fully lined. It has a strapless sweetheart neckline and lightly padded bust. This dress is made of a beautiful semi-sheer fabric in a unique blue mint color with silver metallic glitter throughout. We love the criss cross fabric design at the bust and rhinestone embellishments at the waist. A hidden back zipper completes this dress. 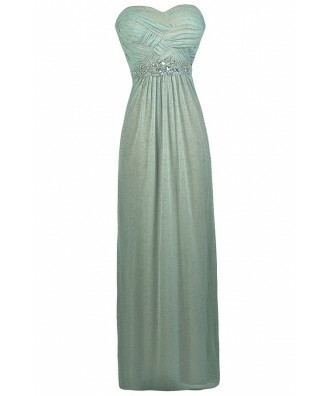 The Northern Lights Aqua and Beige Glitter Maxi Dress is perfect for your next formal event. Pair it with strappy metallic heels, a clutch, and some pretty jewelry! Details: Fully lined. Lightly padded bust. Hidden back zipper. 100% polyester. Lining: 100% polyester. Hand wash gently inside out cold water. Do not wring or twist. Do not rub. Do not bleach. Dry flat. Do not iron glitter. Do not dry clean. Small measurements: Length from top of bust to hemline: 54". Bust: 32". You have added Northern Lights Aqua and Beige Glitter Maxi Dress into Wishlist. You have added Northern Lights Aqua and Beige Glitter Maxi Dress for Stock Notification. 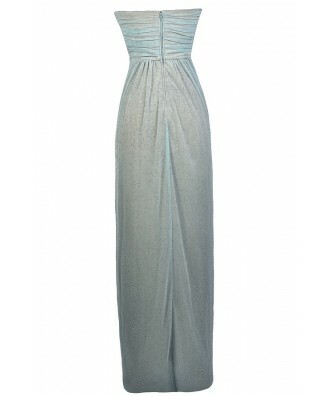 You have set Northern Lights Aqua and Beige Glitter Maxi Dress as a loved product. You have removed Northern Lights Aqua and Beige Glitter Maxi Dress as a loved product.